The beautiful island of Aruba will host the third edition of the Aruba Summer Music Festival. 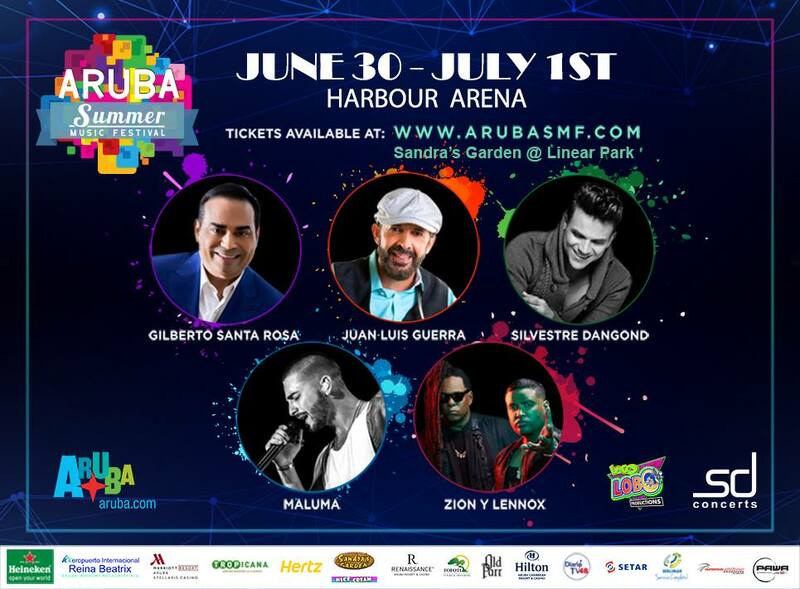 This third edition of a two-day festival features exciting artists; Juan Luis Guerra, Gilberto Santa Rosa, Maluma, Silvestre Dangond, and Zion & Lennox! Previous editions have featured artists like Nicky Jam, Jerry Rivera, Elvis Crespo, Carlos Vives, Pitbull, Enrique Iglesias and Gente de Zona. Packages for the festival are available. Email Loco Lobo Productions at info@arubasmf.com for additional information. The beautiful island of Aruba will host the second edition of the Aruba Summer Music Festival taking place June 30th - July 1st, 2017 at the Harbor Square Arena. Last year was the second edition of the Aruba Summer Music Festival, showcasing International Latin Grammy Award winners alongside Aruba’s best local bands. Headliners for the 2016 event included the world famous Enrique Iglesias, who has won the hearts of many women with his silken voice in songs such as My Hero, Bailamos, Tonight, and El Perdón. The successful merengue/urban duo Chino & Nacho, winning multiple awards for their hits: Mi Niña Bonita, Mi Chica Ideal, Me Voy Enamorando and more. If you want to read all about the first edition of the Aruba Summer Music Festival check out the Blog Aruba Summer Music Festival. For more detailed information including travel packages visit www.arubasmf.com, or search for Aruba Summer Music Festival on facebook. The Aruba Summer Music Festival is being produced by Loco Lobo Production, SD Concerts and supported by The Aruba Tourism Authority.